Whether it's large or small, you should always make sure you have enough funds before embarking on any home renovation project. 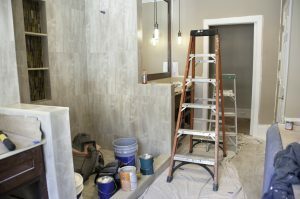 The average bathroom renovation costs about $10,000, although more costly remodels have price tags of more than $23,000. Make sure you can afford everything you envision before diving in. You might also want to consider how much time you plan on spending in the house—most homeowners won't invest a ton of money into a dream bathroom if they plan on leaving. Still, you could justify the project if you think it'll make it easier to sell your property. Rooms such as the bathroom and kitchen will sway many potential buyers, so a remarkably outdated one might need that type of refresh before you leave. Once you choose to go ahead with your renovation plans and decide on an overall amount you can spend, you should sit down and figure out where each dollar will go. Most of the time, you can bet that labor will cost about a third of the budget. Unless you're planning a more superficial update—painting, updating hardware, swapping the shower curtain and more—you should pay an expert to handle the brunt of the hard work. Then, you can figure out what you must include and what you can cut if money's tight. In most cases, you should eliminate luxurious extras if money's running low—you'll need new tile, but you won't need a steam shower. If you're going all out, you could include these extras, as well as foundational updates such as new plumbing, windows or even electrical rewiring. Over 50 percent of men and women take between 10 and 30 minutes to get ready in the morning. As such, you don't want to create a new bathroom that isn't perfect—you spend a lot of time in there. So, log onto Pinterest or pick through a few design magazines until you find a handful of looks that spark your interest. You might not be able to incorporate all the over-the-top features, as mentioned above, but you can use designer spaces to help you choose colors, hardware, countertops, linens or anything you'll use to outfit your new bathroom. Imagine your home only has one bathroom, and you're planning to knock it down and replace it entirely. Where will you go in the interim? It likely goes without saying, but you need to figure this out before you dive into your renovation project. If you have another bathroom in the house, you're in luck. Otherwise, you might have to arrange with a neighbor to use their facilities when necessary or stay with a loved one for a few days while the water's off. You could even rent a Porta-Potty for a few days and place it in your backyard if it's inconvenient to leave your house. No matter what, have this plan in place before you're in desperate need of a bathroom and have nowhere to go. It might go without saying, but you should also know the details of how you're going to cover the costs of your renovation and any additional expenses that might crop up in the process. You won't be able to work with a lender—and, therefore, you won't be able to sign for a loan—until you can provide a detailed explanation of why the project costs what it costs. Of course, a loan isn't your only option when it comes to paying for your project. You might be able to take out a mortgage or even use the cash you've saved over the years. Either way, know what you'll need to pay for everything and use that to figure out where you'll get the money. Throughout the process, you'll want to check back in with your plan and budget. Make sure that your spending is in control and that you're sticking to the design you initially envisioned. Veering from either might cause the project to take longer or cost much more, both of which would make the remodel more of a stressor than it should be; however, if you take all the above precautionary steps, you can go from planning to completion as painlessly as possible. Even better, you'll end up with the bathroom of your dreams.